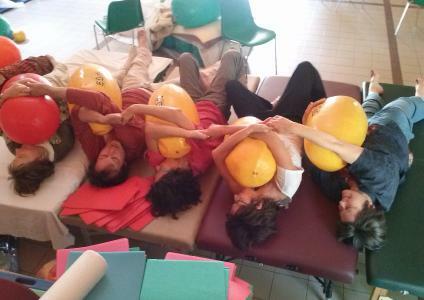 A few photos, a short written testimony, and three short extracts from scenes filmed by Sylvia Ghibaudo in 2008 may give just a little idea of how the introduction of inflatable balls enhances Feldenkrais learning : for practitioners and their « handicapped » partners alike. 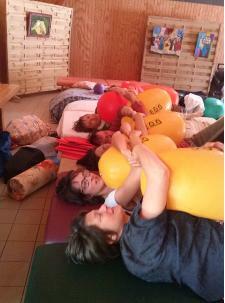 Here is one example of the lessons employing small balls Joëlle has devised for her "Groupe Hémi"
What I felt on the air table. At first it felt rather strange and unfamiliar. Then there was an impression of great comfort as the balls start moulding the curves of my body and perfectly adjusting to itscontours….my morphology. 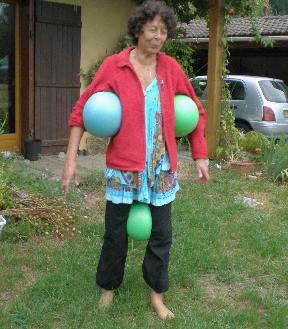 After a few minutes I sense my weight sinking into these balls; I can now relax some muscles which still seem tense, without any fear. If I wriggle a toe, even a very small movement spreads like a wave through my whole body, without any effort on my part as I simply pay attention to the present moment. I feel at peace and whole; there is no more pain and I completely enjoy being rocked infinitely gently on the air table. 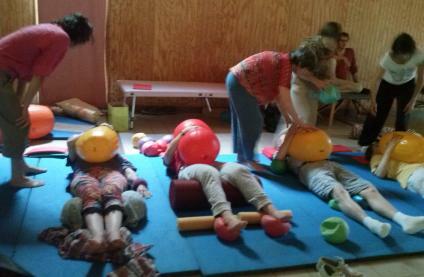 If you go to the French web page, you’ll find two brief descriptions of the positive effects on sensing and enhanced learning when inflatable balls are used in traditional ATM lessons. 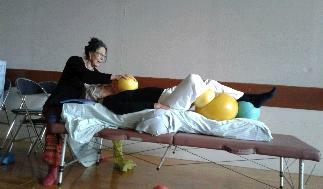 Sylvie spoke very lucidly about the difference she had felt in comparison to what was already familiar to her from previous Feldenkrais experience; for Clothilde the Method was completely new and the balls quite clearly a help in letting go of tension. 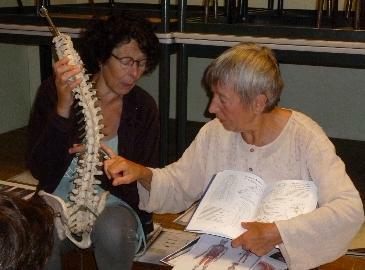 (2) « Laboratory » workshops at La Ruzole du Haut. 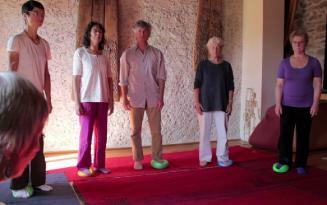 The first documentation of research and discoveries dates from 2008, when Barbara, an American colleague, joined our small group consisting of three Germans. One had come from Israel, the other and myself don’t live all that far from each other in the South-West France. 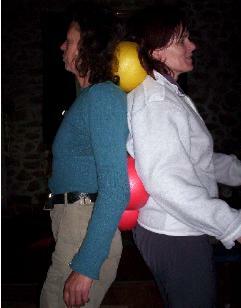 It is thanks to an FI with Barbara during Carl Ginsburg’s Santa Fee Training (1994 – 1997) that I discovered the usefulness of the smallest EGG ball. 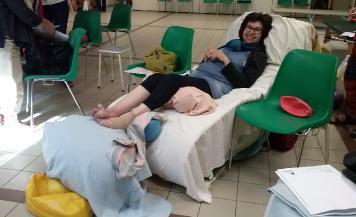 Barbara found it to be a perfect support for her ‘upper’ arm in lying on her side. 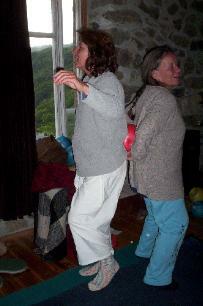 After recreating that FI experience in front of a friend’s camera, Barbara demonstrated what she later discovered on her own back home, and also the previous day when working with a partner. By that time the study group consisted mainly of French colleagues and was conducted in French. One day we had two visitors, Henri, a retired priest with Parkinsons, and Marielaure, another FI student of mine who had become a very good friend. 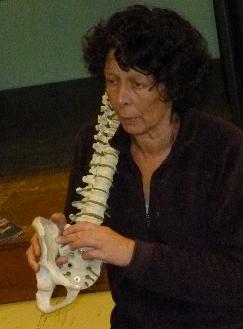 Marielaure is a medical doctor who became convinced of the Feldenkrais Method’s potential for public health, and particulary in preventive activities. Even if the short sequences filmed by Henri are far from professional, they are atmospheric and show the engagement of everyone present. 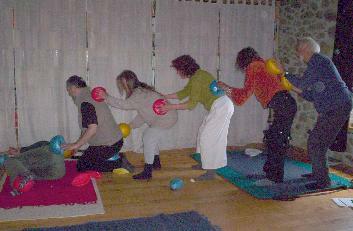 The first excerpt showing the group in discussion was filmed by our extraordinary cameraman perching on a ladder ; the second presents two of the participants’ observations and comments about inflatable learning tools which by that time were already becoming part of these colleagues’ professional skills’. Colette was the first to speak once our extraordinary cameraman was safely perching on a ladder from where he wanted to film the group. 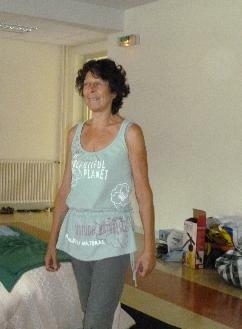 Marielaure had the final word « speaking from a pupil’s point of view ». Thanks to Justin Jones occasionally filming the study group at work that year, the Laboratory 2013 is documented much more extensively than previous encounters. Some of my regular FI and ATM «pupils » agreed to be filmed as well. 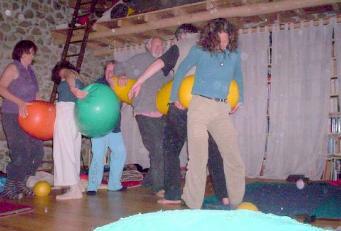 As a result there now exist 4 dvds of 15 year old Anaïs learning the Feldenkrais way of how to prepare for a surgical ‘straightening’ of her scoliotic spine deemed unavoidable and do the prescribed physiotherapy excercises after the operation with hightened awareness and without undue effort. « Anaïs and Her Scoliosis ». 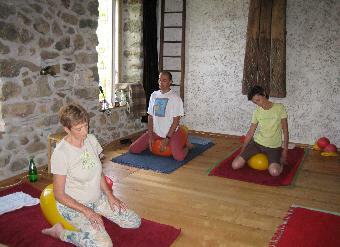 The first FI lesson on DVD dates from spring 2011, a year before the operation. The remaining three were filmed at intervals after the operation in spring 2012. 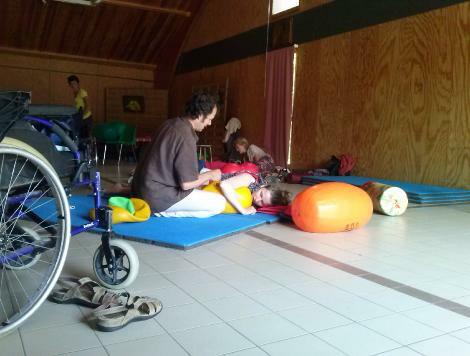 Marie Pierre’s process of learning to cope with difficulties resulting from multiple sclerosis is also well documented in still photos and filmed moments. 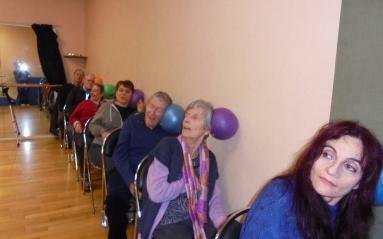 As is shown in a couple of film sequences, elderly people find inflatable balls particularly helpful for gentle mobilisation in overcoming stiffness and tension. My film-maker friend Sylvia Ghibaudo accompanied me once to Jerusalem, where I worked on four occasions at the Princess Basma Center for Disabled Childen on the Mount of Olives (2006–2009).